Taiwan Post released a special souvenir sheet called "Taiwan from the Air" on 8th June honouring the documentary filmmaker Chi Po-lin. The legendary photographer and environmentalist lost his life in 2017 in a helicopter crash when he was filming a sequel to the 2013 documentary Beyond Beauty: Taiwan from Above. The sheet comprises of 4 se-tenant stamps featuring aerial photographs by Chi. 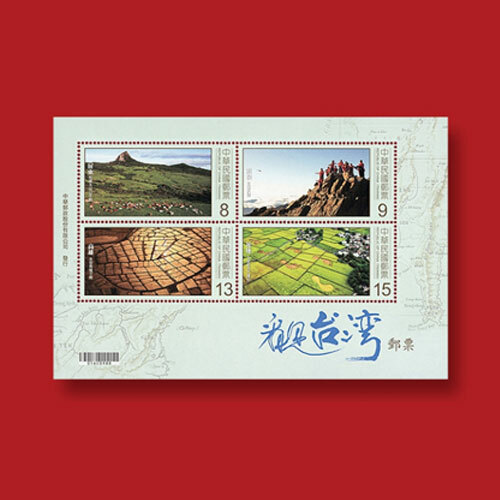 The NT$8 stamp depicts Cattle on Mount Dajian, Hengchun, Pingtung County; the NT$9 stamp shows A Choir on Mount Jade, Nantou County; the NT$13 stamp depicts Setting Sun over Fish-farms, Yongan, Kaohsiung City, and the NT$15 stamp features Giant Footprints in Paddy Fields at Yuli, Hualien Country. The sheet is designed by Arteck Creative Consultants and they were printed by offset at France’s La Poste.